Two seasons ago the number of Australians playing basketball in the Ligue féminine de Basketball had made all the basketball news. Five players had undertaken the journey from "down under" with Renae Camino and Hollie Grima coming to Aix-en-Provence. The 2008-2009 season had been a tough period for the club and the two Australians had left France at the end of the season. Grima (pictured) makes her return to the club after a season in the Czech Republic with Frisco Sika Brno while Natalie Hurst makes her first trip in playing professionally outside Australia. For the second year Aix-en-Provence completes its LFB team roster early. The team will have six new players who will replace Anaïs Déas, Natasa Ivancevic, Guiday Mendy, Claudia Das Neves, Julie Page and Tiffany Stansbury. Greek international Zoi Dimitrakou who had finished last season playing for Spanish club side Cadi La Seu after being released from her contract with A.E Sedis Bàsquet. Emmanuelle Gorjeu will be making her début in the top division after completing her apprenticeship with Avenir de Rennes. Sabrina Reghaïssia is on the move again after one season with Basket Landes, while Lauren Neaves changes club after three seasons with Cob Calais. Hurst (right) has won everything there is to win in 11 years playing in the Australian WNBL. 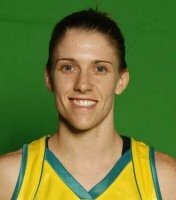 She had to wait until 2009 for her first taste of international basketball with the senior team and was a member of the Australian team that won the 2009 FIBA Oceania Championship. Claire Tomaszewski, Margaux Okou Zouzouo, Isabelle Strunc and Anaïs Viale will return with head coach Emmanuel Cœuret.